Who doesn’t like a nice gameshow? And what’s better than one from back in the day, a nice old school gameshow. While you reminisce about the good old days, you can win prizes, coins and free spins. The bonus features make this slot a real treat. It's only a game-show, and a very popular one at that, back from the 70's and 80's. 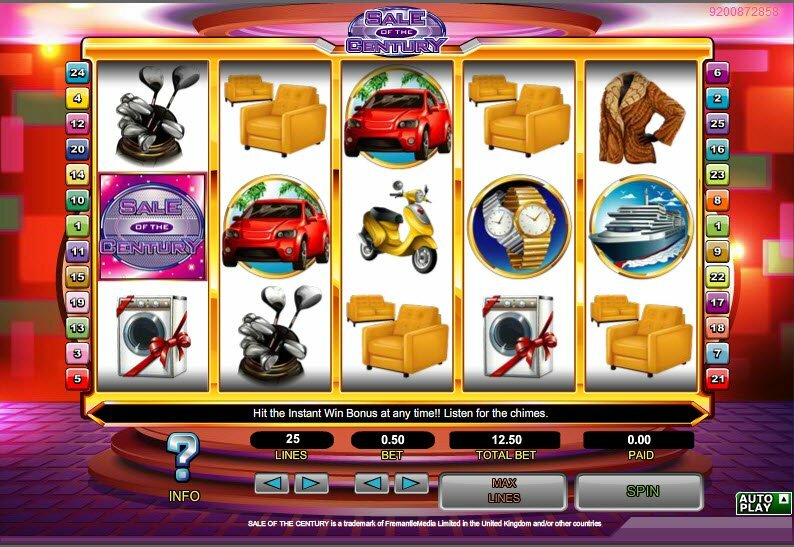 Sale of the Century slot game brings a beloved favourite back to life, complete with the opening music, to get you in the mood for all those bargains. Random Logic, run by 888 bring us the 5 reel, 25 payline Sale of the Century slot, where we can enjoy all the graphic offerings from the actual show. We have the dream sports car, worth 5000 coins as the top prize in Sale of the Century slot. Then there's the cruise on the big old ship, worth a cool grand. There's also the diamond necklace for the lady or the gold or silver manly watch for the gentleman. You also have a choice of the sports scooter bike or a nice fur jacket. Golf clubs or a television are the choice symbol worth 125 coins, and coming in last but by no means least, there's the armchair and couch combo or the brand new washing machine. Two hands fighting it out to be the first on the buzzer, with the answer to the all-important question that will win them Sale of the Century game prizes is our wild symbol. It only appears on reels 2, 3 and 4 to substitute for all other normal symbols and help increase your winning potential. We have the dream sports car, worth 5000 coins as the top prize in Sale of the Century slot. Then there's the cruise on the big old ship, worth a cool grand. 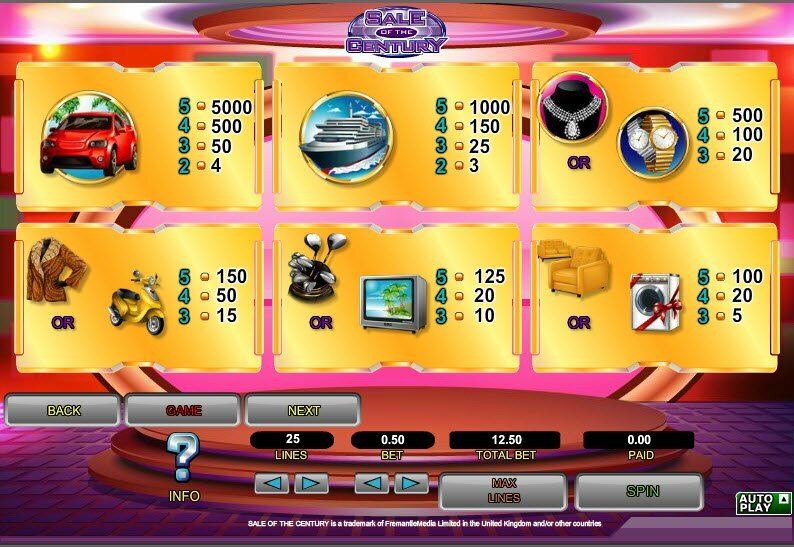 There's a Sale of the Century slot instant win bonus feature that can appear at any time during normal game play and let you chose a shown prize, or reject it for a different mystery prize. The question mark symbol triggers our Super Pick Bonus where you can win a cash prize, get a free game, receive access to the Gift Shop, or get a cash prize and free game! 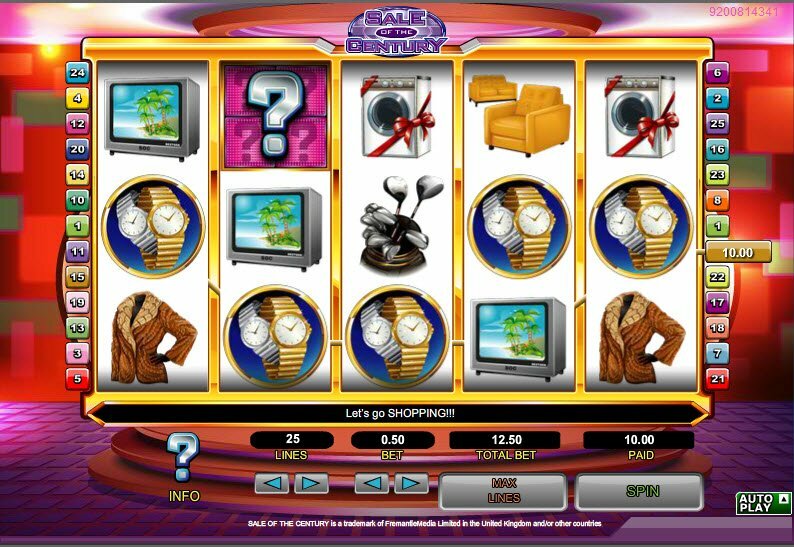 Get 3 Sale of the Century slot scatter symbols and enter the Gift Shop for the fast money spins that turn Sale of the Century into a 3-reel slot.